What has Campus Watch, a project to critique and improve Middle East studies in the United States and Canada, achieved since it opened its doors this week in 2002? Along with like-minded organizations – the National Association of Scholars, the David Horowitz Freedom Center, National Review, and the Manhattan Institute – it assesses what professors are saying and doing, thereby helping to challenge academia's status quo. Critiquing professors is more revolutionary than it may sound, for academics have long been spared public criticism such as that directed toward politicians, business leaders, actors, and athletes. Who would judge them? Students suppress their views to protect their careers; peers are reluctant to criticize each other, lest they in turn suffer attacks; and laymen lack the competence to judge arcane scholarship. As a result, academics have long enjoyed a unique lack of accountability. 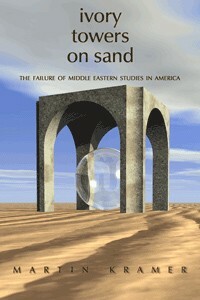 "Ivory Towers on Sand" by Martin Kramer established the intellectual premises for Campus Watch. If Campus Watch, headed by Winfield Myers, has interrupted this charmed academic life by exposing what Martin Kramer of the Washington Institute for Near East Policy has termed the "failure of Middle Eastern studies in America," it is because we consider the work of these specialists too important to be left uncritiqued. We hover over their shoulders and remind them that their egregious statements might well end up ridiculed as our "quote of the month," or even cause them trouble when they try to win tenure or get a new job. Academics criticized by Campus Watch generally respond by calling it names, caricaturing its purpose, and presenting themselves as victims, hoping thereby to render our work illegitimate. Remarkably, I recall not a single case when the meticulously documented and mildly presented work of Campus Watch has met with a serious and substantive rebuttal. So much for the marketplace of ideas. As Middle East specialists themselves acknowledge, this new accountability wrought by Campus Watch has overturned their once-insular world. Their backhanded endorsements in the form of testimonials of living in abject fear of Campus Watch offer one colorful example. Another is the statement by Miriam Cooke of Duke University that "Campus Watch is the Trojan horse whose warriors are already changing the rules of the game not only in Middle East studies but also in the US University as a whole." More positively, the Taskforce on Middle East Anthropology published a handbook on professional responsibility in early 2007 that calls for the implementation of steps long encouraged by Campus Watch. That said, the field's basic problems remain in place: analytical failures, the mixing of politics with scholarship, intolerance of alternative views, apologetics, and the abuse of power over students. Campus Watch's highest priority is to help stimulate a diversity of opinion, so that pro-American scholars – who today make up perhaps 5 percent of Middle East specialists – reach parity with the anti-Americans. This goal has two implications. That professors today can no longer be expected to engage in disinterested scholarship and instruction, but must be balanced by those who will promote an alternative viewpoint. It is sad to see the ideal of objectivity crumble, but this is a reality one must adapt to. That the anti-Americans do not have a monopoly on intelligence or skills, just a near-monopoly on power. The 5 percent figure does not mean that bright historians, political scientists, economists, sociologists, anthropologists, literature and language specialists, et al., are 19 to 1 anti-American, but that this faction has, since the late 1960s, gained a near-stranglehold over their departments. Just as a great ocean vessel requires time to turn, so does the university, where career-tenured faculty rule. Tenure not only guarantees them decades-long job security, but it also inures professors to the demands of the market place or the wishes of students, donors, and other stakeholders. It will take time, but there are grounds for optimism about Middle East studies, which underwent a seismic shift in the aftermath of the 9/11 atrocities. That event led to a surge in enrollments and attracted a new sort of student to the field, one less marginal politically and more publicly ambitious. As this post-9/11 cohort wends its way through the system, expect to see significant improvements. Campus Watch will be there to welcome them. With luck, its mission will be accomplished, and it can then close its doors. Daniel Pipes is the founder of Campus Watch and director of its parent organization, the Middle East Forum. Related Topics: Academia, Middle East studies | Daniel Pipes receive the latest by email: subscribe to the free mef mailing list This text may be reposted or forwarded so long as it is presented as an integral whole with complete and accurate information provided about its author, date, place of publication, and original URL.